Can Tetras of Different Types Form a School? 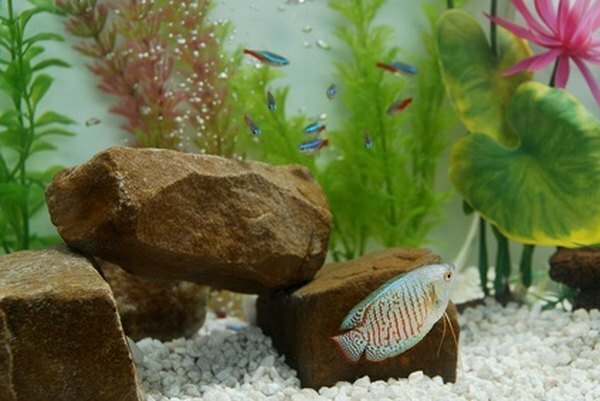 Tetras are colorful, peaceful and inexpensive, depending on the specific species. Most tetras are schooling fish, swimming together in groups. Generally, tetras will only school with their own species. However, there are several situations where fish of different species will school together. Fish school together for protection. Small fish are safer in groups. Their group-movement can confuse predators, making it harder for them to pick off individual fish, or possibly even resembling a larger fish. For this reason, most tetras are schooling fish. Most tetras are so adapted to schooling life that they must be kept in schools, as being kept alone is actually stressful for them. For this reason, keep your tetras in groups of five or more. Generally, tetras will only school with members of their own species. They do this because they are best adapted to working with their own species to form a school. In a large group, it's easier to confuse predators if everyone looks the same. However, there are a few situations where different species school together. And on top of that, fish are living things, and will sometimes go against conventional wisdom for no apparent reason. One major exception to the rule that fish usually only school with their own species is very similar-looking fish. If fish resemble each other closely enough, they may swim together as a group. The best-known example of this is probably the cardinal tetra and the neon tetra. Both are small tetras, with a bright, almost glowing, blue stripe from head to tail and a red stripe below it. Cardinals have a little more red in the body, but the two are similar enough that they will often school together. Another way to "trick" different fish into schooling together is to take advantage of fish that come in several varieties. Selective breeding has developed some species into different breeds, while still being the same species, like a dog. Neon tetras have been selectively bred into golden neon tetras and diamond neon tetras, in additional to the original type. These fish are all still neon tetras and will usually school together, despite having different colors and markings. Are Angelfish Okay to Mix With Goldfish?